Your sweet little Bear Cub is on his own blissful path, entirely too busy with toys, friends and food to take notice of the load in their pants. Bears often need an extra dose of motivation, and giving praise is a great way to go. As their partner, coach and potty mentor, it's up to you to help keep them excited. Recite these potty scripts to your little Cub during the potty training journey, and you're sure to get them moving! Time to use the potty! When you’ve tried, you can go outside to play! I see you didn’t make it to the potty quite on time. Should we try a reminder next time? Want me to set your Time to Potty timer on my phone? 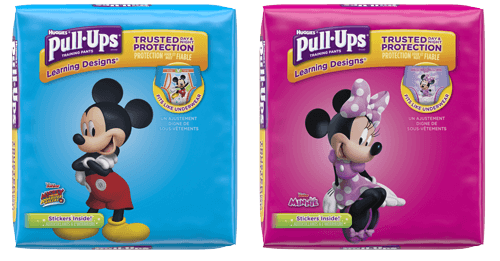 You could use a clean pair of Pull-Ups®. See how the little design disappeared? That means you went pee pee in it. Let’s try and see if you have any more pee pee on the potty, then we can put on a clean one. See the design? You can check it to see if you're still dry. Now that you’re in preschool, lots of other kids are using the potty. It’s time for you to learn to use it more, too. Your teacher will pick a potty buddy for you to go with, so you can remind each other. I have this new book on dragons you will love! Let’s read it while we’re on the potty and it can be your special bathroom book. Whoops, it looks like you didn’t make it to the potty again. I think it’s time for a break. Let’s forget about the potty for a little while and try again in a couple of weeks. I felt the poops pressing inside my tummy, trying to get out. I got it all out. Wow, my tummy feels so good now! Big Kids put their poop in the potty. Want to dump this poop from your Pull-Ups into the toilet and see how that looks? Can you make a poop as big as Daddy’s? Let’s see! I think you might need to go poop soon. Let me take off your pants. Do you want to practice taking off your Pull-Ups so you’ll be ready when the poop comes?